PETALING JAYA (Oct 9): O&C Resources Bhd (OCR) had launched its Isola @ KLCC project along Jalan Yap Kwan Seng — with units carrying a price tag of RM1,900 psf or RM1.2 million each — last Saturday (Oct 7). The project comprises only 140 units, or one unit per floor across four residential blocks, with built-ups ranging from 636 sq ft to 3,390 sq ft. The layout of the units is reflected in its namesake Isola, which means “island” in Italian. According to OCR managing director Billy Ong in a statement today, 40% of the units have been sold, while a further 40% of the units have been booked. “The response we received was tremendously encouraging. Aside from local purchasers, we have international purchasers from Hong Kong, Indonesia, Korea, Taiwan, China and England as well,” said Ong. OCR has teamed up with award-winning architectural firm Unit One Design for the project design to deliver what it ambitiously claims as “luxurious brand homes that are unique to the Malaysian market, incorporating innovative features that people have yet to experience”. Some of the facilities in the development include a business centre, resident lounge, sky pool, indoor gym and party suite. “Another vital element of the property would be the efficient automated car parking system designed by Unit One Design that reflects the space-saving design inspiration and architecture. It is equipped with an automated system that transports cars to and from the parking bays,” he added. 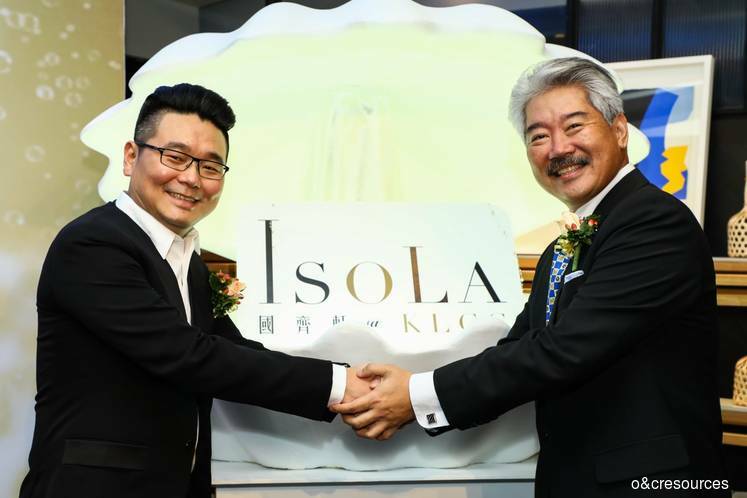 Addressing the current slowdown in the property market, he believes there is still significant demand for properties within KLCC, based on the response Isola has received locally and abroad. In terms of access, Isola is accessible via major highways and access roads such as Jalan Tun Razak, Jalan Sultan Ismail, SMART Highway, Penchala Link Highway, SPRINT Highway, Duta-Ulu Kelang Expressway and Ampang-Kuala Lumpur Elevated Highway. There are also RapidKL and light rail transit services within the vicinity of the development. The project has a GDV of RM240 million and is slated for completion by 2021.